Finite Mathematics: An Applied Approach, 11th Edition once again lives up to its reputation as a clearly written, comprehensive finite mathematics book. This Edition builds upon a solid foundation by integrating new features and techniques that further enhance student interest and involvement. All existing problems have been updated to provide relevance and timeliness. Finite Mathematics contains the same elements such as Step-by-Step Examples, Exercise Sets, and Learning Objectives in every chapter. In an engaging and accessible style, this text demonstrates how mathematics applies to various fields of study. The text is packed with real data and real-life applications to business, economics, social and life sciences. Michael Sullivan is Professor Emeritus in the Department of Mathematics and Computer Science at Chicago State University where he taught for 35 years before retiring a few years ago. 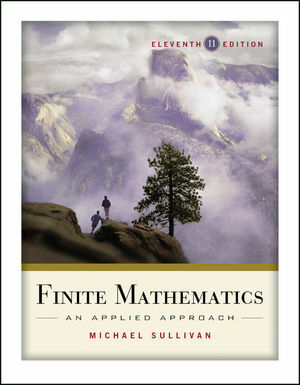 Dr. Sullivan is a member of American Mathematical Society, the Mathematical Association of America, and the American Mathematical Association of Two Year Colleges. He is President of Text and Academic Authors Association and represents that organization on the Authors Coalition of America, Mike has been writing textbooks in mathematics for over 30 years. He currently has 13 books in print: 3 texts with John Wiley & Sons and 10 with Prentice-Hall. Six of these titles are co-authored with his son, Michael Sullivan III. He has four children: Kathleen, who teaches college mathematics; Michael, who teaches college mathematics, Dan who is a Prentice-Hall sales representative, and Colleen, who teaches middle school mathematics. Nine grandchildren round out the family. 1.3. Applications to Business and Economics. 1.4. Scatter Diagrams; Linear Curve Fitting. Chapter 2: Systems of Linear Equations. 2.1 Systems of Linear Equations: Substitution; Elimination. 2.2 Systems of Linear Equations: Gauss-Jordan Method. 2.3 Systems of m Linear Equations Containing n Variables. 3.3 The Inverse of a Matrix. 3.4 Applications in Economics (the Leontief Model), Accounting, and Statistics (the Method of Least Squares). Chapter 4: Linear Programming with Two Variables. 4.1 Systems of Linear Inequalities. 4.2 A Geometric Approach to Linear Programming Problems. Chapter 5: Linear Programming: Simplex Method. 5.1 The Simplex Tableau; Pivoting. 5.2 The Simplex Method; Solving Maximum Problems in Standard Form. 5.3 Solving Minimum Problems Using the Daily Principle. 5.4 The Simplex Method for Problems Not in Standard Form. 6.4 Present Value of an Annuity; Amortization. 6.5 Annuities and Amortization Using Recursive Sequences. 7.2 The Number of Elements in a Set. 7.4 Sample Spaces and the Assignment of Probabilities. 7.5 Properties of the Probability of an Event. Chapter 8: Bayes' Theorem; The Binomial Probability Model. 8.6 The Binomial Probability Model. 9.1 Introduction to Statistics: Data and Sampling. 9.2 Representing Qualitative Data Graphically: Bar Graphs; Pie Charts. 9.3 Organizing and Displaying Quantitative Data. 9.4 Measures of Central Tendency. Chapter 10: Markov Chains; Games. 10.1 Markov Chains and Transition Matrices. 10.6 Optimal Strategy in Two-Person Zero-Sum Games with 2 X 2 Matrices. 11.3 Implications; The Biconditional Connective; Tautologies. A.4 Recursive Defined Sequences: Geometric Sequences. Appendix B: Using LINDO to Solve Linear Programming Problems. C.2 Using a Graphing Utility to Graph Equations. C.4 Using a Graphing Utility to Graph Inequalities. Chapter Openers and Projects: A number of these have been updated and in some cases, replaced. Applied Examples and Exercises: These have been updated throughout the text. In addition, new applications have been added where appropriate throughout the book. Earlier Presentation on Probability: For the new edition, the author has also extensively revised Chapters 7 and 8 on probability. These changes represent a reordering and consolidation of Chapters 6, 7, and 8 of the previous edition. The author’s goal in making these changes is to present probability sooner, while covering counting techniques (permutations and combinations) later in the text. This way, students can master probability before proceeding gradually to more challenging subject matter. New section: The Binomial Probability Model: The author has also added a new section (8.6) to Chapter 8 called The Binomial Probability Model. Chapter Opening and Chapter Project: Each chapter begins with a situation and ends with a related project. A Look Back… A Look Forward: Each chapter begins with a discussion of the relationship between what has been learned earlier and what is coming next. Objectives: Each section begins with a list of learning objectives. The objectives also appear in the text where the objective is covered and are repeated in the Chapter Review along with Review Exercises that relate to the objective. Preparing For This Section: Most sections begin with a list of key concepts to review in preparation for the section. Page references are provided for easy access. Related “Are You Prepared?” problems are given at the beginning of the exercise set to help students assess their understanding of these concepts. Now Work Problems: Following most examples, the student is directed to a related problem in the exercise sets that assesses understanding before going further in the text. Step-by-Step Examples: Examples contain detailed, step-by-step solutions, most with explanatory annotations. Using Technology: These worked examples show students how to use a graphing calculator and/or Microsoft Excel to solve complex, computation-heavy problems (often these examples are first solved in the text using paper-and-pencil methods). Where appropriate, Using Technology examples show TI-84 Plus or Excel screen shots. Exercises that require use of a calculator or spreadsheet are indicated by icons and purple problem numbers. “Are You Prepared?”—These exercises related to the review topics listed in Preparing for This section. For convenience, page references to the review material are included. Concepts and Vocabulary—Easy True/False, Fill-in-the-Blank problems test vocabulary and important ideas found in the section. Skill Building—These problems provide straight-forward practice. Applications and Extensions—These applied problems relate to real-world situations. Discussion and Writing—These problems, which are highlighted in green, support class discussion, collaborative learning, verbalisation and writing of mathematical ideas, and research projects.